I woke to a chorus of roosters just as the alarm on my phone sounded at 4:15 a.m. With a 64-mile relay, it’s difficult to pack for the day, and as I lay in bed last night, I thought of several more things that might be useful. I unzipped my backpack and shoved in a roll of toilet paper and a notebook and pen. I had a nightmare in which we were along the course and I sorely needed to use the bathroom, so I took care of that, woke Trent (who slept on my couch last night), and we stumbled out the door to meet the van. Somehow Joey 81 was able to get a rental van donated for the day. He also got us matching printed dry-fit t-shirts. It was impressive. Dan took the day off to drive the van, and Chris came along as something of a cheerleader. Other than that, it was the 6 of us on the relay team: Joey 81, Jim, Trent, Erin, AJ, and me. 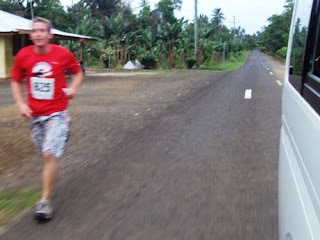 We rolled into the carpark at Sinalei Beach Resort in Siumu at exactly 5:30 a.m., and at 6:05, AJ took off on the first leg. 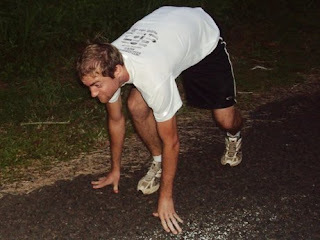 In order to ensure teams finished around the same time, starting times were staggered to allow those who estimated a longer finish time to start the day early. Some teams started as early as 2:30 a.m. or 3:00 a.m. We were scheduled to start at 6:00, and we were the second to last group. We had a leap frog system. 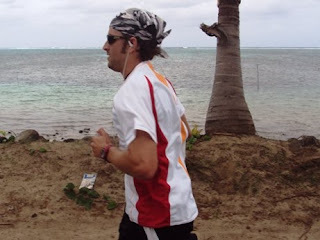 After AJ started the race, we would drive past him to the beginning of the next leg. We would all get out of the van to cheer, Trent warmed up, AJ would eventually show up, pass the baton to Trent, AJ would stretch a little, and we’d repeat the process with the next runner. And so on from there for 23 legs. Not knowing what kind of downtime we’d have—we’re talking about 64 miles, even if every person runs a 7-minute mile, that’s still 7.5 hours total. And for every extra minute anyone takes, that’s another hour. So I brought a book just in case. I didn’t need it. Between the warming up, the cooling down, the constant stretching to stay warm, the cheering, and teaching Dan how to drive stick shift from the backseat, it was a full day. The weather was almost perfect. It was cool and windy and overcast for most of the day. The sun peeked out sometime around noon, but by then everyone was completing their last legs, and though it felt somewhat akin to running through hell, it was all the more incentive to finish faster. Since start times were staggered, we spent most of the day by ourselves, but toward the end, we began to catch up to other teams. 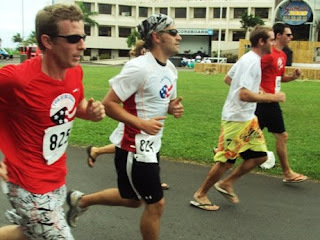 Running a race by yourself would be a curious thing in America, and no less in Samoa. Running by rural fales, we got our fair share of confused looks. But most people would smile and nod and say hello. Kids would wave, which was fun. They’d occasionally call out, “Bye bye, palagi!”, which becomes increasingly irksome after a while, but whatev. Our finish time was somewhere in the ballpark of 8 hours 35 minutes, which made everyone proud. We’re pretty sure we placed second overall (out of eleven teams), but we’re still waiting for official results. In the meantime, our team dispersed to shower and nap. 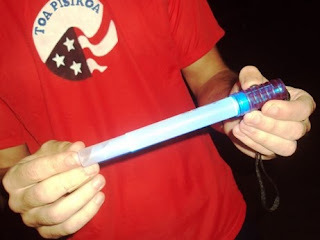 The baton, a mini-light sabre, was pretty gross by the end of the day. 64 miles in sweaty hands is not pretty, particularly for the lanyard. 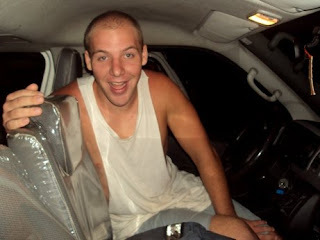 Since AJ had to run up a gravel driveway before dawn, we were instructed to follow him in the van, blasting him with our headlights. This picture is slightly ghoulish. 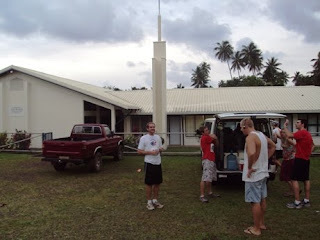 Mormon churches along the route agreed to open their doors to let relay teams use their bathrooms. Erin being interview for TV3. 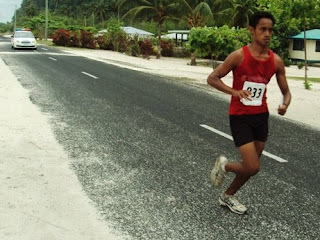 Pene, above, was on the fastest team. You might also recognize him from my year 12 class. 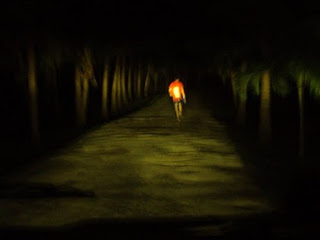 He was the runner who overtook our runner near Saleapaga. Joey mid-leg, as taken from the van. Probably more relay pics tomorrow. Pretty impressive! Congratulations to all six of you. Nice of the Mormons to provide bathrooms. Congratulations to your team! i defn think yr team rocked in 2nd. And can i say that certain rescue services teams DID NOT impress us with their slack observation of the rules. When youre killing yrself out there to make it to the end - its vaguely annoying when a team has about 12 people on their truck and arent following any system of running order...just running haphazardly as they ran out of air! Congratulations to yr team and hope you all get some good recovery this weekend. This race will be like no other you will do! (Unless you do it again next year). It was well worth all the effort. 7 minute miles....I can only dream of such things! Those shirts you wore must have pretty hot. very nice of the Mormons!! LOL!